Our PR team has won a major nationwide accolade at the PRCA Digital Awards, fighting off stiff competition from some of the biggest agencies in the world. We won the Best Use of Reporting and Measurement in a Campaign award for its work for sports retailer Decathlon. 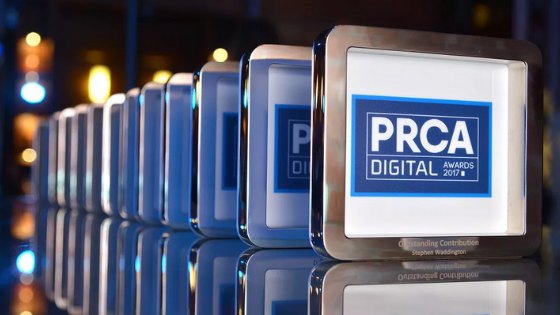 Held at the St. Pancras Renaissance in London, the PRCA Digital Awards 2019 recognised the talent and impact of individuals, teams and campaigns from the best of the digital PR and communications profession. PR Agency One was praised by judges for its innovative and unique approach to measurement. The agency has spent the last eight years developing its own proprietary suite of PR measurement products that cover everything from brand, reputation and commercial outcomes, both on and offline. The company’s measurement suite includes a range of packages for organisations of all shapes and sizes, such as a low budget option for smaller businesses, through to more premium managed service for larger enterprises. Winning this national award from the PRCA demonstrates how our commitment to innovation, within the field of research and measurement, is setting the standard at a national and possibly even international level. The award is judged by many of the biggest names in PR and is recognition that our approach affords clients a greater level of clarity and a better understanding about the effectiveness of their PR and marketing campaigns. Find out more about our measurement suite here.